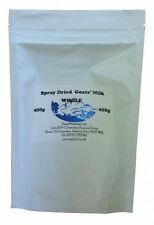 Whole Dried Goats' Milk Powder - 400g re-sealable pouch. This Goats' milk powder has been prepared only from fresh full cream milk that has been simply spray-dried to yield a free flowing product of superb quality. It does not depend upon supplies of frozen goats’ milk for its production and so retains more of the natural vitamins and goodness. TheAged Goat Capriccio cheese is a cheese produced only with goat's milk. Try it in risotto. SAFETY, QUICKNESS AND RELIABILITY. TOGETHER IS MORE FUN AND TASTY. TASTE EXPLORERS. GOAT CHEESE CHEVRE. Cheese back then was made in small batches, each carefully handcrafted and full of flavour. Our cheese kits have preserved this flavour! 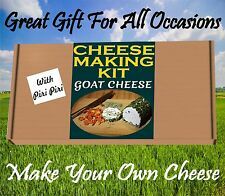 CHEESE MAKING KIT-Goat Cheese. Goat Cheese. 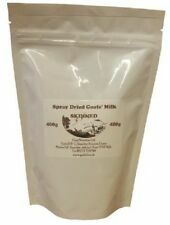 Skimmed Dried Goats' Milk Powder - 400g re-sealable pouch. It does not depend upon supplies of frozen goats’ milk for its production and so retains more of the natural vitamins and goodness. Whole dried goats' milk also available. These 400g (14 oz.). To Prepare: For 1 litre, slowly add 960ml of water to 125g of Whole Dried Milk Powder stirring vigorously - or use a whisk or electric food mixer. GOAT CHEESE. Goat Cheese. GOAT CHEESE RECIPE . Cheese back then was made in small batches, each carefully handcrafted and full of flavor. Our cheese kits have preserved this flavor ! 2 x CHEESE MAKING KIT. GOAT CHEESE WITH CRACKED BLACK PEPPER. GOAT CHEESE. Goat Cheese. GOAT CHEESE RECIPE . 3 x CHEESE MAKING KIT. Cheese back then was made in small batches, each carefully handcrafted and full of flavor. GOAT CHEESE & PIRI PIRI. PIRI PIRI SPICE MIX . Goat Cheese. GOAT CHEESE RECIPE . 2 X CHEESE MAKING KIT. Cheese back then was made in small batches, each carefully handcrafted and full of flavour. The Fresh Cheese Kit contains everything you need to create a range of delicious cheeses in the traditional, artisan way. GOAT CHEESE WITH HERBS DE PROVENCE. GOAT CHEESE & HERBS DE PROVENCE. HERBS DE PROVENCE . Goat Cheese. GOAT CHEESE RECIPE . 3 X CHEESE MAKING KIT. Cheese back then was made in small batches, each carefully handcrafted and full of flavor. The Primosale cheese of goat 3B is a spreadable cheese made from goat's milk. Primosale has white in color, Primosale from goat's milk is a fresh cheese obtained by the processing of milk, only follows a salting. Goat Lipase 25 gr tub 80 UC. Extra concentrated! Goat Lipase. Strength: 80 UC. Dosage apx 0.5 gr. Depends on the cheese. Dilute in cold boiled water and add to the milk before the rennet. GOAT CHEESE WITH CRACKED BLACK PEPPER. GOAT CHEESE. Goat Cheese. GOAT CHEESE RECIPE . 2 x CHEESE MAKING KIT. Cheese back then was made in small batches, each carefully handcrafted and full of flavor. GOAT CHEESE & Chilli. Goat Cheese. GOAT CHEESE RECIPE . 3 x CHEESE MAKING KIT. Cheese back then was made in small batches, each carefully handcrafted and full of flavor. The Fresh Cheese Kit contains everything you need to create a range of delicious cheeses in the traditional, artisan way. GOAT CHEESE WITH HERBS DE PROVENCE. GOAT CHEESE & HERBS DE PROVENCE. HERBS DE PROVENCE . Goat Cheese. GOAT CHEESE RECIPE . 2 X CHEESE MAKING KIT. Cheese back then was made in small batches, each carefully handcrafted and full of flavor. GOAT CHEESE & chilli. Goat Cheese. GOAT CHEESE RECIPE . 2 x CHEESE MAKING KIT. Cheese back then was made in small batches, each carefully handcrafted and full of flavor. The Fresh Cheese Kit contains everything you need to create a range of delicious cheeses in the traditional, artisan way. Kaprone is a cheese produced by the dairyBotalla in Piedmont.Kaprone is produced with goat's milk, which is used raw for the preparation of theKaprone. Aromatic cheese from the finest hints, it's nice to combine it with a red wine like a Dolcetto or a Barbera. GOAT CHEESE CHEVRE. 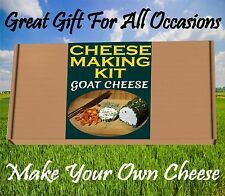 CHEESE MAKING KIT-Goat Cheese. Goat Cheese. GOAT CHEESE RECIPE . Cheese back then was made in small batches, each carefully handcrafted and full of flavor. Our cheese kits have preserved this flavor ! Kid, Ziege, Goat Rennet +lab+stremsel+cuajo+caglio. But also mixtures of milk or pure cow’s-milk will be very suitable in combination with BIOREN®– Liquid Rennet Paste Piccante to produce extraordinary cheeses. Because of its natural pureness BIOREN®– Liquid Rennet Paste Piccante does not need to be filtered and can therefore be directly added to the milk. TheCusiè cheese is produced by Beppino Occelli with cow's and goat's milk.Cusiè is a seasoned cheese that is aged for at least four months in Valcasotto's cellar on wooden planks. Beppino Occelli. GOAT CHEESE & PIRI PIRI. PIRI PIRI SPICE MIX . Goat Cheese. GOAT CHEESE RECIPE . 3 X CHEESE MAKING KIT. Cheese back then was made in small batches, each carefully handcrafted and full of flavour. The Fresh Cheese Kit contains everything you need to create a range of delicious cheeses in the traditional, artisan way. GOAT CHEESE. Goat Cheese. GOAT CHEESE RECIPE . CHEESE MAKING KIT. Cheese back then was made in small batches, each carefully handcrafted and full of flavour. The Fresh Cheese Kit contains everything you need to create a range of delicious cheeses in the traditional, artisan way. GOAT CHEESE. Goat Cheese. GOAT CHEESE RECIPE . Cheese back then was made in small batches, each carefully handcrafted and full of flavor. Our cheese kits have preserved this flavor ! 3 x CHEESE MAKING KIT. Capriziola is a herbaceous short-aged cheese made with only goat's milk. Produced with goat's milk this is very tasty and characteristic cheese, very similar to the DOP gorgonzola but with the characteristic that the milk used is goat and not vaccine. Beppino Occelli. TheOccelli cow's and goat Losa cheese is a semi-matured cheese made from selected goat and cow's raw milk of Italian origin. TheOccelli Losa is a semi-matured soft cheese,with charatteristcs square shape. Try the unique taste of the young matured goats cheese from our collection. You will enjoy this creamy flavour, which is also very good for your health. It’s a kind discovered by more people. The product is made from goats milk and has a very distinctive taste. B. C. in cheese-making; a short manual for farm cheese-makers in cheddar. Bacteriology of cheddar cheese - E. G. Discover the history and processes involved in making all types of cheese – from fancy continental cheeses to old favorites, both from goat’s milk and cow’s milk. You can recognize the matured goats cheese by its white colour and firm structure. It’s an exceptional sort among all the other cheeses, but nevertheless worth trying. The taste is described as very distinctive and can be very different even though all pieces are originated from goat milk. If the cheese is a piece of cheese, we cut your cheese fresh from the blade and wrap the cheese neatly in vacuum. Matured naturally for 10 months. Fat 48 , pasteurised goat's milk, rennet, salt, lactic acid. Old Goat's Cheese | /- 1 kilo / 2.2 lbs. If the cheese is a piece of cheese, we cut your cheese fresh from the blade and wrap the cheese neatly in vacuum. Matured naturally for 10 months. Fat 48 , pasteurised goat's milk, rennet, salt, lactic acid. GOAT CHEESE WITH HERBS DE PROVENCE. GOAT CHEESE & HERBS DE PROVENCE. HERBS DE PROVENCE . Goat Cheese. GOAT CHEESE RECIPE . CHEESE MAKING KIT. Cheese back then was made in small batches, each carefully handcrafted and full of flavour. GOAT CHEESE & chilli. Goat Cheese. GOAT CHEESE RECIPE . CHEESE MAKING KIT. Cheese back then was made in small batches, each carefully handcrafted and full of flavour. The Fresh Cheese Kit contains everything you need to create a range of delicious cheeses in the traditional, artisan way. Goats Cheese Stinging Nettle is a delicious Dutch hard cheese made of goat's milk with a light and creamy taste. Little flecks of stinging nettle give this goats cheese a specific but subtle spicy flavour. Cheese back then was made in small batches, each carefully handcrafted and full of flavour. Our cheese kits have preserved this flavour! GOAT CHEESE. Goat Cheese. GOAT CHEESE RECIPE . CHEESE MAKING KIT. GOAT CHEESE & HERBS. Goat Cheese. GOAT CHEESE RECIPE . CHEESE MAKING KIT. Cheese back then was made in small batches, each carefully handcrafted and full of flavour. The Fresh Cheese Kit contains everything you need to create a range of delicious cheeses in the traditional, artisan way. Matured goat cheese | /- 1 kilo / 2.2 lbs. You can recognize the matured goats cheese by its white colour and firm structure. It’s an exceptional sort among all the other cheeses, but nevertheless worth trying. If the cheese is a piece of cheese, we cut your cheese fresh from the blade and wrap the cheese neatly in vacuum. Extra quality goat's cheese, with a wonderfully creamy taste with peppers and garden herbs. Organic Goat cheese has always been a real treat for one who loves cheese. Now this treat can be enjoyed responsibly. The goats are for example only being fed organic food and there were no chemical and artificial substances used for the fertilization of the land. This light goats cheese has a soft silky flavour. Goats Cheese Tomato Olive is a healthy and savoury treat. If the cheese is a piece of cheese, we cut your cheese fresh from the blade and wrap the cheese neatly in vacuum. Goats Cheese Fenugreek is a combination of fresh, light and creamy Dutch goats cheese and slightly spicy fenugreek seeds that give it a surprising flavour. The aromatic fenugreek adds an exotic touch to the soft taste of the goats cheese, and supplies a hint of Asia. Halloumi, Feta, Mozzarella, Ricotta, Ricotta Salata Fresh Goats cheese, Burratta and more cheeses! Cheese Making Kit - Makes more than 20 Batches. You can make yourself a lot of cheese with this big cheese making kit.